Utilizing Creative Curriculum as our model, our program (for children up to 3 years of age) is designed to promote learning and development through daily routines amongst multiple learning environments in our spacious centers. We know that the first three years of life are more important than any other time for learning and growth. Our goal is to help children learn about themselves, their feelings, and others. 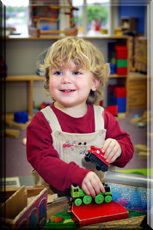 Our program will enhance their communication and motor skills. We will guide them with a positive approach and respond to challenging behaviors. As your child's first teacher, we look forward to working with you to help take your child’s first step into education.